Harika managed to secure a queenside majority in an ending from a Bb5+ Sicilian against Marie Sebag, but the French GM had a lot of counterplay with her more active pieces. Perhaps 17. Nf3 would have secured a greater advantage for White than trading queens on d5 immediately, since the knight on d2 proved to be quite restricted. After that, while there were many changes that occurred in the position, both players played accurately and a draw was agreed after all that was left was opposite bishops and a few pawns. A well played game, and as with many such games, eventually both players simply ran out of resources. My first impression of this game is that Dzagnidze was out to play the black pieces as White, and Krush certainly didn’t mind. They ended up trading into an endgame where Black definitely had the edge, both in space and in piece play, but with limited material the win can often prove elusive. Krush had no intention of letting Dzagnidze off easily, however, and used her two bishops and extra space to huff and puff on White’s positional castle. For awhile it looked like Dzagnidze was holding down the fort, but she took a risk by taking on b4 on the 50th move. Even so, had White traded the d pawn for the c-pawn, she likely would have held the draw. 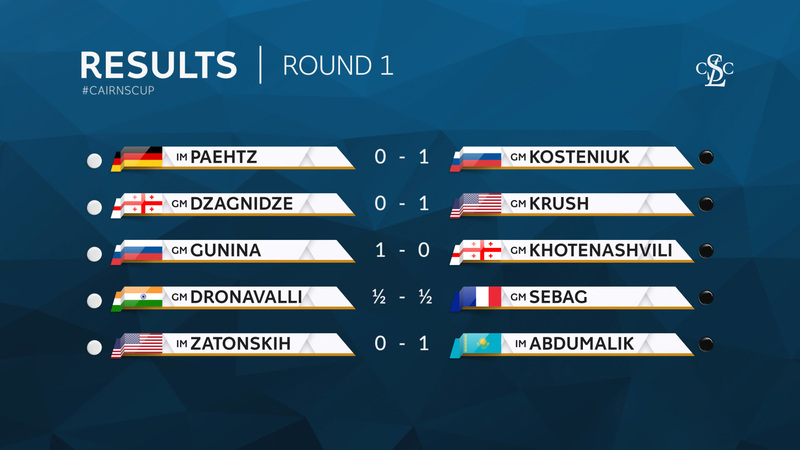 Instead, Dzagnidze took excessive risks, and Krush’s pawns ended up winning the day. Both sides had their passers, but Black’s were simply much faster. 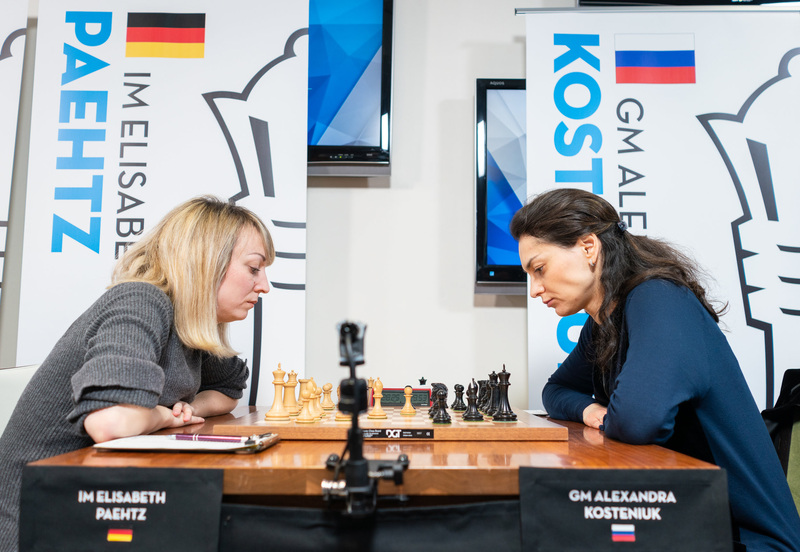 Quite a back and forth affair, but Irina kept a cool head and punished Dzagnidze when she overstepped her bounds. This game started out quietly enough, but both players were using up lots of time. 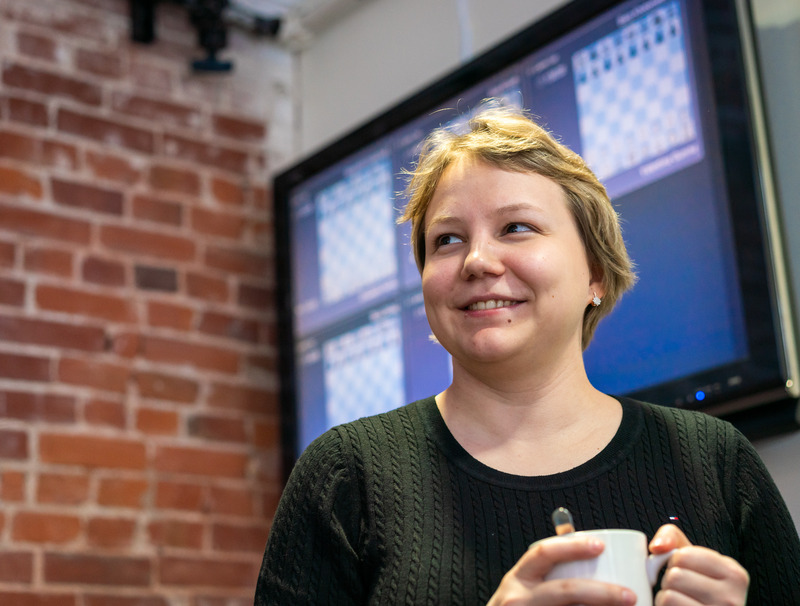 The game opened up when Gunina forced Khotenashvili to surrender her light-squared bishop, then traded a central pawn for Black’s h6 pawn. I would have preferred putting the light-squared bishop on b7 to avoid this type of position. Unfortunately for Bela, her situation went bad to worse for Black, as her knight ended up stuck on b2 and she had less than a minute on the clock by move 25. Valentina also ended up in time pressure, however, and in a time scramble no position is that easy to figure out. It seems nobody informed her of this, however, and she shoved her kingside pawns with reckless abandon despite the lack of time on her clock. This paid off well for her, and when the dust settled on move 40, it was clear her h-pawn would be too powerful. Quite an impressive game from the white side, and definitely a textbook example of why you can’t relax too much no matter how safe the position looks. Valentina was in good spirits before the round, and probably in better ones after her fine victory! 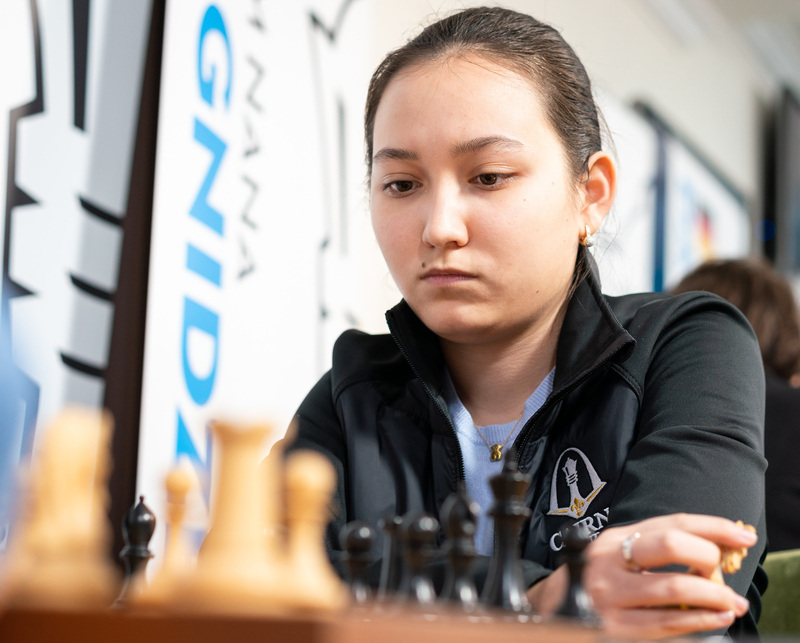 Anna and Zhansaya blitzed out a sharp Grunfeld line where they trade queens and end up in an unbalanced, yet approximately equal ending. Black’s two bishops should compensate for the doubled a pawns, but it is quite difficult to do anything active. While most games in this line end in a draw, the ending hardly looks dead to me, and I’m thankful these players proved me right. I expected Zatonskih to play the solid 22. F3, but she played the much more ambitious 22. E4 and expanded in the center. This was a fearless decision, especially considering the fact she was quite low on the clock, and ultimately this backfired on her. When the position opened up it seemed like Black’s bishops gained in strength, although it only became really problematic after White played 30. Nc4. This allowed Abdumalik to open up her b7 bishop, which helped support her dangerous pawn lurking on h3. Anna pitched her center and pinned her hopes on the queenside, but Black’s play proved to be much more dangerous. An impressive win by the young Kazakh, and if her foes didn’t know the danger she represents before, they certainly know now. The young Kazakh IM, Zhansaya Abdumalik, meant business in the first round. 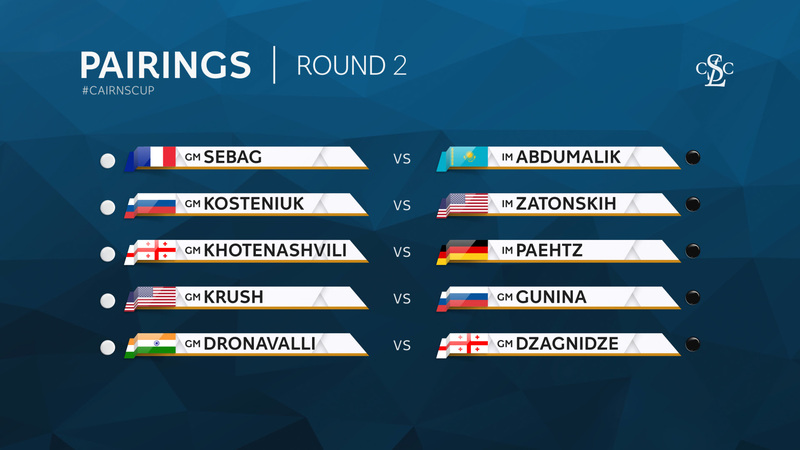 It will be hard to top the fighting chess that occurred in round one, but there is no doubt the players will try. Here are the pairings for round two.